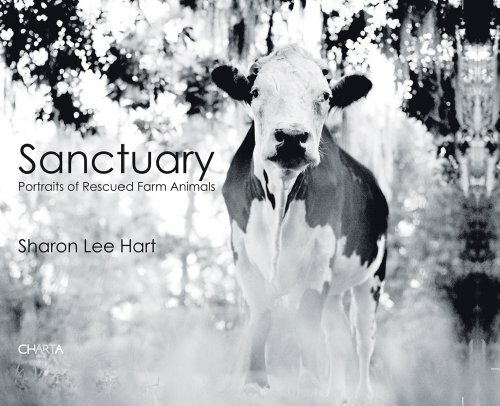 This first monograph by Lexington–based photographer Sharon Lee Hart is a book of dignified black-and-white portraits of rescued farm animals, accompanied by handwritten stories by sanctuary workers. A lifelong vegetarian, Hart considers farm animals “some of the most abused, overlooked animals on the planet.” For this project, she traveled to sanctuaries in Virginia, Florida, Maryland, Michigan and New York State to document “the lucky few who are free to live out their lives in peace.” Not surprisingly, after spending time with the animals she discovered that each had its unique personality. “Some are quirky or funny, while others sensitive, shy, playful, intelligent, mischievous, or inquisitive. And all seemed to have complex emotional lives.” These characteristics come through in Hart’s poignant photographs. Essays are by Karen Davis, president of United Poultry Concerns; Kathy Stevens, founder of the Catskill Animal Sanctuary; and Gene Bauer, founder of Farm Sanctuary.